18 January 1865 William Mowbray lost his job and the same day came down with such a severe bout of diarrhoea that he died. The British and Prudential Insurance Company paid Mary Ann 05 on her husband’s policy. In March 1865 Margaret died of “gastric fever”. The insurance paid a further £30 on the deaths of the children. Bundling up her remaining child, Mary Ann moved to Seaham Harbour where she fell in love with Joseph Nattrass but he was already married and refused to leave his wife. Mary Ann landed a job at the Sunderland Infirmary, where she fell for ex-patient George Ward, and they married in August 1865. Fourteen months later, he was dead from “fever”. He left everything to his widow and she also received an insurance payout. At the end of 1866 she began working for a shipyard foreman John Robinson, whose wife had died not long earlier. His youngest child died shortly after and Mary Ann, who became pregnant, comforted him. She went to visit her mother who died on 9 June, nine days after Mary Ann’s arrival. She ransacked her mother’s house and took daughter Isabella back to the Robinson household. By the end of April, Isabella was dead from “gastric fever” and so were two of Robinson’s children. In August 1867 Mary Ann married Robinson and in November Mary Isabella was born. She died four months later of “gastric fever”. That year Mary Ann stole £50, ran up debts of £60 and insisted that James Robinson insure his life — he threw her out. She met widower Frederick Cotton, the brother of a friend, Margaret. In March 1870 Margaret died of “gastric fever” and not long after Mary Ann was pregnant with her 11th child. Frederick and Mary Ann married bigamously in September 1870. A son, Robert, was born early in 1871. On 19 September Frederick Cotton died, followed by Robert. She took up again with Joseph Nattrass — he died on 1 April 1872. She was offered a job as a nurse by a parish official, Thomas Riley, but her stepson Charles Edward Cotton was “in the way” and shortly after a workhouse rejected him, he died on 12 July 1872. Riley was shocked by the boy’s sudden death and went to the village police to make a complaint. She was arrested for Charles’ murder although the trial was delayed until after the birth of her 12th child. Her trial began on Wednesday 5 March 1873 and she claimed that Charles had died from exposure to arsenic in the wallpaper. After 90 minutes, the jury found her guilty. 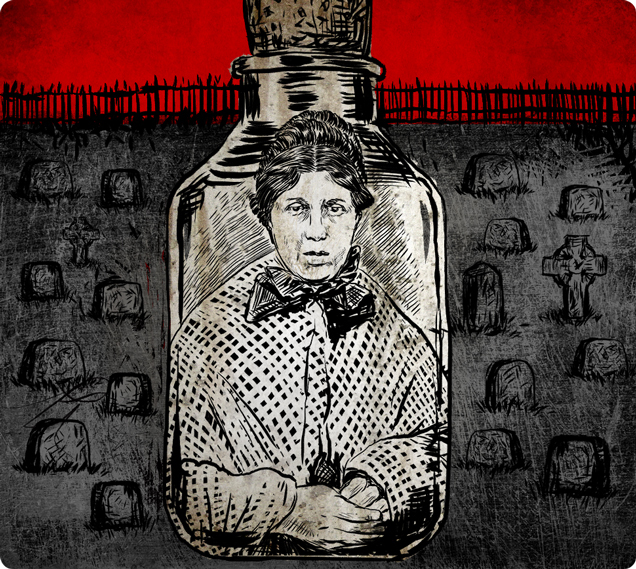 She was hanged at Durham County Jail on 24 March 1873. Mary Ann Cotton left descendants. One son was killed in a train crash before the end of the First World War and another was alive in 1950.